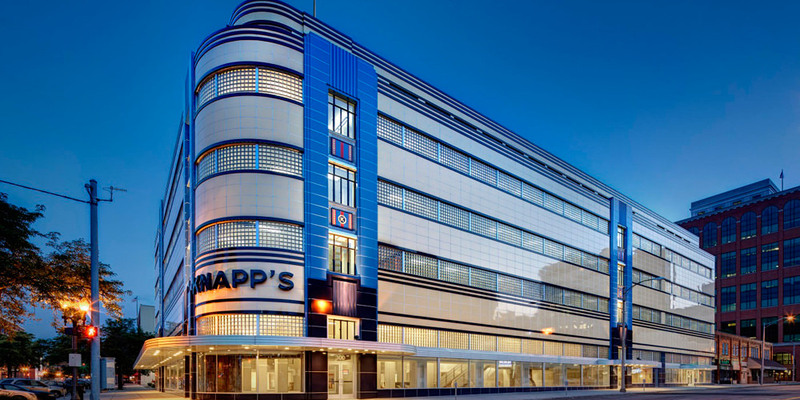 The Knapp’s Centre Historic Renovation Project involved refurbishing the former J.W. Knapp’s Department Store, an icon in downtown Lansing that is listed on the National Register of Historic Places, into a mixed use development. The newly renovated five-story building includes retail and restaurants on the first floor, Class A office space on floors two through four while the fifth floor and penthouse features high-end residential units, adaptively re-using a landmark facility. The exterior looks almost the same as originally built, but utilizes modern materials. The original pale yellow and blue metal and porcelain panels were replaced with matching steel and baked-on enamel panels. The original glass blocks used as an extensive architectural feature were also replaced with modern glass block. The signature curved front and origninal signage was restored to its original state. The interior features a three-story atrium with a skylight at the top, pedestrian walkways that span the upper floors, a lobby and a “fashion incubator” on the first floor for designers to create and sell their clothing. Original elements of the interior include portions of terrazzo flooring, brass stairway handrails and stairways.